Each clockwise or counterclockwise swing of the balance wheel is called a beat. The number of degrees of rotation of the beat is the amplitude of the balance. 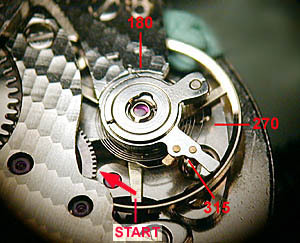 In most contemporary wristwatches, the amplitude of the balance in a horizontal position (i.e. dial up or dial down) should fall between 275 and 315 degrees. Low amplitude will affect the rate of the watch (speeding it up because the shorter swings complete more quickly). Excessive amplitude may result in the impulse pin on the impulse roller coming completely around and hitting the back of the pallet fork. Amplitude may be measured with an electronic timer, or may be visually estimated. In the illustration the balance is in its centered (rest) position. The clockwise travel of one spoke (bottom) is indicated. Normally, the spoke will travel to between 275 and 315 degrees before reversing its direction, returning to center, and traveling 275 to 315 degrees counterclockwise.